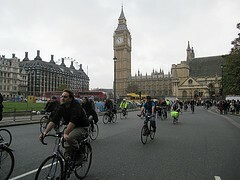 A late night debate in the House of Commons saw 100 MP’s last night debate the Get Britain Cycling report. The report, published earlier this year, was compiled following a six-week inquiry by the All Party Parliamentary Cycling Group (APPCG). Cross party support for the report shows that there is an appetite within Government to introduce improved and safer cycling infrastructure, whilst increasing the number of people cycling through initiatives aimed at children and commuters. "First, we must end the stop-start approach to supporting cycling, which means that we need long-term funding of the infrastructure needed for dedicated separate safe cycling routes." A serious rethink of priorities within the roads budget with a proportion reallocated to deliver a long-term funding settlement for cycling infrastructure. An obligation on planners to cycle-proof new policies and projects. We need new enforceable design standards and measures to ensure compliance. National targets to cut deaths and serious injuries to be restored, but they should sit alongside a new target to increase levels of cycling. Learn from Wales and extend to England its active travel legislation, which sets out clear duties on local authorities to support cycling. Local authorities are central to devising, prioritising and delivering measures to support cycling. We must ensure that children and young people have every opportunity to cycle and to do so safely. We need to make it easier for cycling to become part of the journey to work, even when the commute is too far to do by bike alone. Employers can play an important role in providing access to showers, changing facilities and lockers. However, our public transport providers need to step up and do much more too. We need to ensure that justice is done and seen to be done in cases where collisions lead to the death of cyclists and serious injuries. We need tough new rules and requirements on heavy goods vehicles that are involved in about a fifth of all cycling fatalities, despite the fact that HGVs make up just 6% of road traffic—there is clearly an issue there. Whilst not referring to the cycle to work scheme specifically in the report, it is clear that cycling to work meets key cross party objectives to encourage active travel. Cycle Solutions and other members of the Cycle to Work Alliance, will be continuing to work with the UK and regional governments to ensure that cycling, and in particular cycling to work, remain at the forefront of the UK and Local Government’s plans.